Yeah, Yeah, Yeah! This is our very first Beatle Brunch blog. On this blog, we hope to update you on what’s new with the show, Beatle Brunch, which can be heard on broadcast radio every week in about 100 cities in the U.S., Canada, and The Virgin Island, but is now making an impression on the web via our website, Brunchradio.com and our member site, the Beatle Brunch Club (BBC). As a member of The BBC, you can chat with other members, enjoy live celebrity chats, read news and features about The Beatles AND listen to each week’s Beatle Brunch radio show on demand, commercial free. Plus, we have thousands of videos, audio clips and songs in the BBC that you won’t find on youtube, google or other sites. We’re not monitored by those sites and we put up what our members want. That’s it and that’s cool! I’m the writer of this, Joe Johnson. I’ve been a Beatle fan since they appeared on the Ed Sullivan Show in 1964 and then the following week, came to Miami, where I live, to play The Deauville Hotel on Miami Beach. Our local radio station, 560 WQAM, covered their arrival at Miami International Airport, live on the radio. They were one of the first stations in history to use a wireless microphone, while the competition was tied to a pay phone in the concourse held by a 2 foot cord. 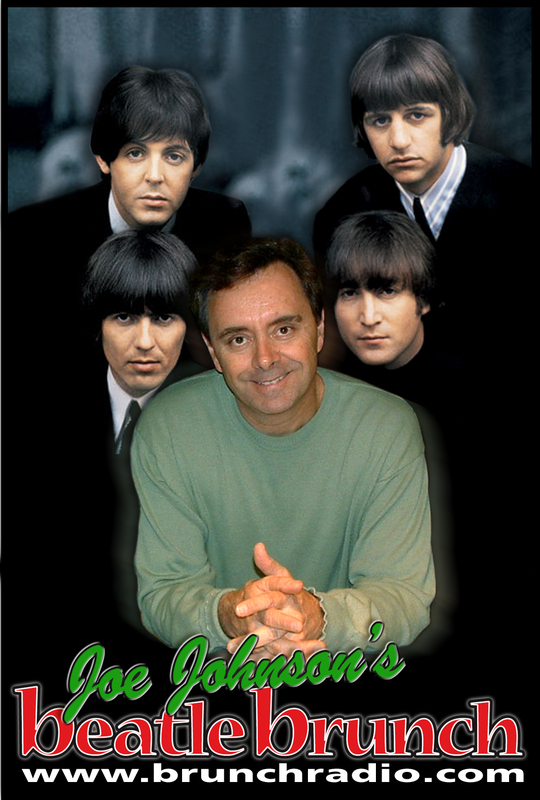 Needless to say, WQAM won the Beatle battle. I came up with the idea for the show 20 years ago (“It was 20 years ago today”), while driving in my new car, the first one I owned with an in-dash CD player (car nerds: It was a black 1992 Mitzubishi Eclipse Turbo). I took along a stack of Beatles CDs to enjoy on a long ride, and thought, “why isn’t there a weekly radio show on The Beatles airing on the radio here in Miami?” I ran the idea of producing a weekly Beatles show, by my boss, who was all for it. He threw it back in my corner and the first show I produced, was one celebrating the 25th Anniversary of the release of the Sgt. Pepper’s LHCB album. The first broadcast occurred on Sunday, May 31st, 1992 on Miami station, Majic 102.7 (where I still work), and four other radio stations our group owned at the time, in Baltimore, MD; Laconia, NH; Rochester, NY; and Indianapolis, IN. Today the show airs on about 100 stations (more on that in a later blog). This June 2nd will be the beginning of our 21st year broadcasting Beatle Brunch. Think about it: when the show started, there was essentially no internet, no email, no downloads of audio or video, no youtube, Facebook or Twitter and you certainly couldn’t blog like this. The show was then recorded on analog 1/4 inch tape and in some cases, a DAT., but it was all done in real time. That means an hour long show took an hour to copy. There were no recordable CDs, and when they finally did arrive, blank CDs were cost prohibitive, about $20 each. Eventually I bought a CD stacked recorder and copied the shows four at time to send to the affiliate stations. At that time Beatle Brunch was not yet syndicated. I’ll blog about that in a future column. It’s a cool story, but kind of long and winding. Anyway, thanks for reading this. I’ll get better at designing my blog, inserting pics and links and so much more. Meanwhile please “like” Beatle Brunch on Facebook and also follow me on Twitter, on both Beatle Brunch and JoeJohnsonOnAir. Happy New Year! Hope to see you on the radio show! If the show does not air in your city, you can join http://www.beatlebrunchclub.com to hear the show on demand, or listen via one of the stations that stream audio, and listen when Beatle Brunch airs in that city. To make it easy, we’ve included the link to my Miami station, Majic 102.7, on our website. Beatle Brunch airs at 10 am on Sunday in Miami.